Specification Model: SK68 3 Modes(High low Strobe) Emitter: 3W UV LED Bulb Number: 1 Color BIN: Violet Total Batteries: 1 OutPut (W): 3 Color: Black Material: Aluminum alloy Wave Length(nm):395-410 Switch Location: Tail button switch Service Life: 50,000hrs Special Features: Water resistant Battery Configuration :1 x AA/1 x 14500 rechargeable battery (not included). Working Voltage: 3.6-9V. 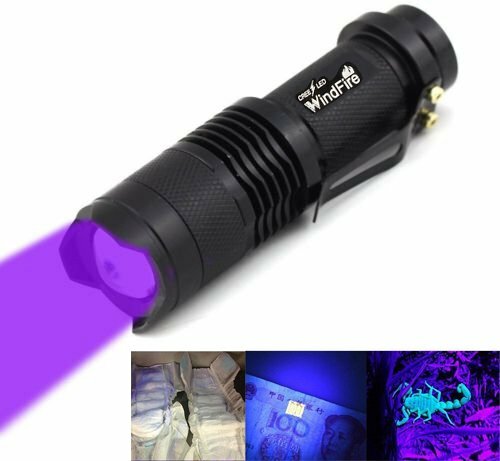 Dimension (CM): 10 x 3 x 3 Package Contents: 1 x WindFire® Wf-SK68 Zoom 3 Modes UV-Ultraviolet Led Blacklight Flashlight AA/14500 Rechargeable Battery UV Ultraviolet Blacklight Flashlight Torch WindFire After Service: 30 Days Money Back Guarantee, 12 Months Warranty!